From one end of the Diaspora to the other, a need was felt to add components to the Service of Shavuot. The components added, “Akdamut,” “Before I Speak,” created in and added throughout the world of Ashkenazic Jewry, and “Ketubah,” “The Marriage Contract,” created in and very popular in the world of Sephardic Jewry, were expressions of the unique conditions existing in those areas of the Exile. Akdamut is a “piyut,” a religious poem, which was composed during the First Crusade, which began in 1096, as an effort by Christian Europe to recapture the “Holy Land” from the Moslem “infidels” who had seized it. On their way to the Middle East, the Christian knights would, in general, visit terror if not outright destruction upon the Jewish communities which happened to be on their route. It was a time of oppression, of cruelty, of ignorance on the part of the Jews’ neighbors. There was absolutely nothing attractive in the dominant culture in Europe at that time. This then was the background of Akdamut, composed at that time by Rabbi Meir son of Rabbi Yitzchak, who was the “Chazan” of the City of Vermaiza, in Germany. The position “Chazan” is not directly translatable as “Cantor,” which is its current meaning, for at that time, there was the additional connotation of great Talmudic scholarship associated with the position and, indeed, this particular Chazan is supposed to have been one of the teachers of the great Bible and Talmud Commentator, RASHI. The poem describes the words of the author as he “debated” the truths of Judaism to a hostile audience. But they are disguised for posterity in the Aramaic language, which was not understood by the Christian world or its censors. The author, who died shortly after the “debate,” left behind a priceless inheritance for the Jewish People, the piyut of Akdamut. 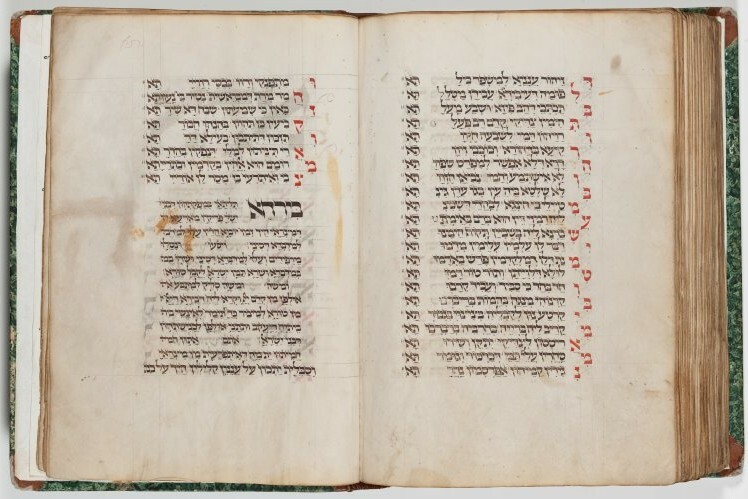 The practice began to chant Akdamut on Shavuot, with its characteristic melody, at the beginning of the public reading which includes the “Aseret HaDibrot,” the Ten Commandments. Akdamut has ninety lines; the first forty-four begin with a double Aleph-Bet; Aleph, Aleph, Bet, Bet, and so on. The first letters of the next forty-six lines make up an acrostic in which the author expresses the prayer that the L-rd will bless him with the ability and opportunity, even in the extremely hostile environment in which he found himself, to grow in knowledge of Torah and in the performance of good deeds. The lightest of the letters. O most beautiful of the nations? And we’ll satisfy all your desires! Compared to the reward that He has in store for us! While you go, then are destroyed in darkness! Never abandon their faith forever! Be strong in your faith! And gave us His Torah. This “piyut,” actually a love song, modelled after Shir HaShirim, the Book of the Bible which is a metaphor for the relationship between the Holy One, Blessed Be He, and the People of Israel. The poem takes on the form of a marriage contract between Israel and the Torah, composed by Rabbi Yisrael Najara. It emerged from the world of Sefardic Jewry, which at that time was radically different from Christian Europe. The Sefardic World, ruled mainly by the Moslems, had many features which were attractive to the Jewish communities which lived among them. The Moslems at that time were world leaders in Poetry, Philosophy, Grammar, Mathematics and many other cultural expressions. This caused a reaction in the Jewish communities, which took the form of an unprecedented focus on such areas as, essentially, all the branches of culture cited above, as illustrative of the Moslem world. The time of Rabbi Yisrael Najara, a great Jewish Grammarian and Poet, was indeed a Golden Age, unprecedented perhaps, in the range of opportunities available to Jews, and taken advantage of by Jews, till the Golden Age of America. “Forever and ever, and for Eternity. “And all is strong, and clear, and steadfast! So no one would break through! The Heavens and the Earth!